Poids: 90g. Important: nous ne livrons pas dans les îles, colonies et les autres terroirs au-delà. Nous ne pouvons pas fournir d'assistance technique spécialisée. Fred Gin and Titonic Novelty Ice Cubes Tray Includes 4 Ocean Liners & Icebergs. Fred - Gin & Titonic - Bac à glaçons. Important: nous ne livrons pas dans les îles, colonies et les autres terroirs au-delà. Nous ne pouvons pas fournir d'assistance technique spécialisée. There's no cooler way to wet your whistle. Goods will be dispatched as soon as possible upon the receipt of cleared funds. 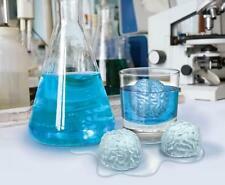 The Brain Freeze silicone ice tray allows you to make brain ice cube shapes which are sure to liven up any drink. Each tray makes 4 large ice cubes - re-usable and dishwasher safe. Made by Fred. Goods will be dispatched as soon as possible upon the receipt of cleared funds. Silicone ice tray to create handgun ice cubes. Take aim at your warm drinks. Goods will be dispatched as soon as possible upon the receipt of cleared funds. Fred Ice Lolly Mould. Approx 10cm long of ice mould (where the liquid goes to freeze). Fred Blue Gin & Titonic Icetray. 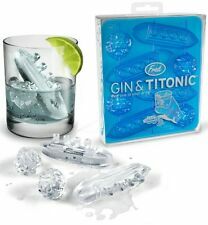 Gin and Titonic Ice Cube Tray is made from synthetic rubber and makes 4 Titanic and 4 iceberg shaped ice cubes. 4 Ocean Liners & 4 Iceberg Food Grade Silicone Moulds. Fred Brain Freeze Ice Cube Mould.1 x Fred BRAIN FREEZE Ice Cube Mould. Colour: Brain Freeze. Cleaning is a snap since the tray is dishwasher-safe. Model Number: BRFR. Frozen fruit juice can make different-coloured brains for a fun variation. COOL JAZZ Ice Cocktail Stirrers Freeze, stir, and chill. It's time to kick back and chill - and here's a cool way to do it. Drop one of these groovy guitars into your drink and give it a stir. Just the thing for jazzing up your favourite beverage. Tray makes three ice mould guitars. FRED COOL JAZZ (ELECTRIC, ACOUSTIC & ELECTRIC BASS GUITAR SHAPED) ICE STIRRERS / CUBES. Donne 2 1/4" Ice Shot verre. Funky Ice Cube Tray! Creates uniquely shaped ice cubes. Fred Cool Shooters Ice Cube Tray. Chill Shot Glasses. Any electrical goods we always test and let you know if they are in good working order. Get in Touch. Fred glace sucette moule. Environ 10cm long de moule de glace (où le liquide va geler). 2 samurai x glace moules pop. Environ 20cm long depuis l’extrémité de la poignée à l’extrémité du tapis végétal. Fred Frozen Smiles Ice Tray - Fred Frozen Smiles Ice Tray. Fred Congelés Sourires Bac �� Glaçons - Fred Frozen Smiles Ice Tray. Fred Cool Shooters Shot Glass Ice Tray - Fred Cool Shooters Shot Glass Ice Tray. Fred Freeze! Ice Tray - Fred Freeze! Bac À Glaçons - Fred Freeze! You get 4 ocean liners and 4 icebergs in each Gin and Titonic. 14.6 x 3.2 x 15.9 cmIce Ahoy! Fred Gin & Titonic Ice Tray - Fred Gin & Titonic Ice Tray. Fred Gin Et Bac À Glaçons Titonic - Fred Gin & Titonic Ice Tray. The tray has 4 round raindrop shapes. 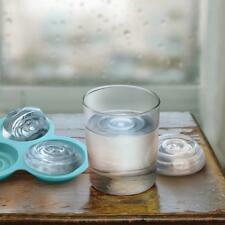 Once frozen the silicone tray lets you easily drop your mould into your drink. Fill and freeze the reuseable Cone Chillers tray. Ice Cube Tray. Skull and Crossbones. 2/ CAKE TOPPERS & CANDLES -A huge selection to make your cakes stand out from the crowd. Chill your beverages to the bone! Pop a few rounds of these finely-tooled ice cubes into your beverages and watch things cool down. "Freeze" is just the thing for fully-loaded drinks! ABOMINABLE ICE MOULDS. You can breed them yourself: just fill and freeze the silicone tray in your personal tundra (err, the fridge) and pop out your own batch of six Abominable Ice. There’s a yeti in your drink! BONE CHILLERS SKULL SHAPED ICE CUBES. Give your drinks a scary twist!Skull andcrossbones shapedice-cube tray, ideal for fancy dress or hallowe'en parties! Skull and CrossBones Shaped Ice Cube Tray. Boys' Stuff. Fred - Gin & Titonic - Bac à glaçons. Vos cocktails seront des plus originaux avec les moules à glaçons Gin & Titonic ! Matériau: Silicone. Fred & Friends Gel Gun Ice Cube Tray-Freeze Freeze! FRED FR1633. Poids: 90g. Mais rassurez-vous, c'est très rare! Nous préférons vous prévenir d'avance et être honnêtes. Bac de 6 Glaçons. - Bac en Silicone. Bac de 6 GlaçonsBac en Silicone. Brain Freeze ice tray - bac à glaçons 'Cerveau'. FRED Brain Freeze. Mais rassurez-vous, c'est très rare! Nous préférons vous prévenir d'avance et être honnêtes. Fred - Gin & Titonic - Bac à glaçons. Vos cocktails seront des plus originaux avec les moules à glaçons Gin & Titonic ! Mais rassurez-vous, c'est très rare! We humans are well known for our highly-evolved sense of humor - as evidenced by Brain Freeze, the ice tray that makes 4 frosty brains. So let's celebrate our higher powers by raising a glass.